Southern Rhodesia was the last British colony to gain independence from its former colonial master. As with the other former colonies that gained their independence, there was great hope for the economic future of the new nation of Zimbabwe under the new national leader, Robert Mugabe. One of the first acts of the new government was to intervene in and direct the new nation's economic affairs. At the time, most national leaders of sub-Saharan Africa leaned toward Marxist economics and raised money by turning on the printing presses to create new currency out of thin air. National economies languished as prices escalated with the entrance of the newly-printed currency into the economy. The value of African currencies dropped relative to other currencies, including the South African Rand prior to 1994 when the Rand was the currency of exchange in underground markets across Southern Africa. The printing of excess currency by sub-Saharan political leaders that resulted in price inflation in local markets and currency devaluation relative to other currencies had a precedent in the Weimar republic of Germany. Post-colonial African leaders had learned nothing from the economic upheavals of that republic. 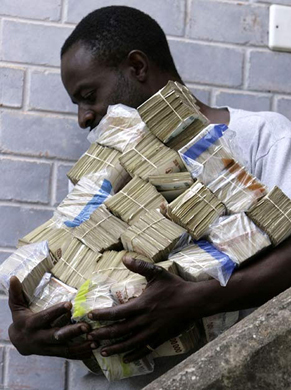 The downward spiral of Zimbabwe stands as a testament to failed economic policies and excess printing of currency. As happened during the Weimar republic, the political leadership in Zimbabwe today rejects any suggestion of the failure of its economic, fiscal and monetary policies. Political leaders invariably seek scapegoats on whom to pin the blame. In pre-WW2 Germany, the blame was placed on the Jewish people. In Zimbabwe, the white farmers were blamed for causing economic hardship by refusing to share their land. Over the past decade, the United States Federal Reserve has printed an excessive amount of currency and kept interest rates at artificially low levels that in no way reflect activity in the market. The result is the combination of malinvestment in stocks and bonds plus a stagnant economy that seems unable to create new long-term employment opportunities for citizens who are willing to work. In small economies such as those of sub-Sahara Africa, Iceland, Ireland and Greece, the effects of excess printing of money and excess government spending occurred rapidly and brought the governments of these countries to their senses. But the sheer size of the once-productive American economy delays the onset of the negative effects of the excessive printing of currency and huge budget deficits. The comparatively slow pace of economic deterioration in the USA allows the Chairman of the Federal Reserve to continue to print excess currency and maintain the policy of low-interest rates, while Keynesian economists such as Paul Krugman continue to call for even more government spending. The formerly communist economies of Eastern Europe, in contrast, collapsed rapidly after the Afghan war when the government of the former Soviet Union was no longer able to subsidize its satellite states. While the citizens of many Soviet satellites were left impoverished, a return to economic freedom allowed some of them the opportunity to rebuild some semblance of prosperity. They were able to create some wealth through creative and productive endeavors, using barter and trade in an unofficial economy as the means by which to exchange goods and services of value. Zimbabwe stands as a stark example of how people with limited entrepreneurial ability struggle to survive after a prolonged legacy of excess printing of currency, wasteful government spending and failed economic policies. However, the writings and policy advice of an economist like Paul Krugman suggest that he does not recognize or accept the idea of wasteful spending by government. Neither does Robert Mugabe of Zimbabwe, and neither did Nicolae Ceausescu of Romania. "The long-discredited economic theory of Keynes counsels that during times of economic slowdown, governments spend money to restart a slow economy. Despite repeated economic stimulus through new spending, the American economy seems unable to respond to such fiscal stimulus." The long-discredited economic theory of Keynes counsels that during times of economic slowdown, governments spend money to restart a slow economy. Despite repeated economic stimulus through new spending, the American economy seems unable to respond to such fiscal stimulus. But political leaders who are influenced by theorists like Krugman seem oblivious to the fact that they are guided by a flawed economic theory. When the socialist economies of Eastern Europe collapsed, enterprising citizens were able to use reliable foreign currencies as a medium of exchange in the unofficial economy. Through many years of South African apartheid, enterprising citizens who lived in the inflation-ridden nations to the north of South Africa used the Rand as currency in the underground economy. The majority of people who work in modern day India do so in that nation's massive underground economy, activities helped by India not having excessively printed rupees to the point of undermining the nation's economy. Argentina experienced a major economic downturn after the regime of Carlos Menem printed excess currency and spent money wastefully. Ordinary Argentineans survived through activity in the underground economy that included barter and trade using local currencies. But government officials entered the underground economies and often subverted the local currencies, and action that ultimately hurt the ordinary Argentineans who were trying to survive through an economic downturn precipitated by their national government. There are a growing number of Americans who recognize the potential for their economy to deteriorate into a very major downturn, something on par with economic events in Greece, Argentina, Iceland and even Zimbabwe. The number of survivalist web sites and books on survival during a severe economic downturn is growing. These websites and books paint a bleak picture of what lies ahead economically, in the USA and even in Canada, which is heavily dependent on trans-border trade. People are being advised to acquire land and seeds and to learn to grow their own food during an expected prolonged economic downturn, and to learn to trade through barter in unofficial local economies. A growing number of economists suspect that instead of cutting back on money creation and spending, the Federal Reserve and the US government may actually opt for the kind of hyperinflation that occurred in Zimbabwe and in the Weimar republic. Part of the hyperinflation may be driven by world money markets dumping massive amounts of American currency as the value of the dollar declines against other currencies. In such an event, massive numbers of Americans will face levels of economic hardship similar to what occurred in Argentina during that nation's fiscal crisis. A severe economic downturn in the USA will undoubtedly affect Canada as well. There is an emerging political movement in the USA, the Tea Party movement, that seeks to use the political system to head off the possibility of hyperinflation. In the short term, the congressional elections may result in political change that could curtail the American president's spending tendencies. If the emerging political movement has any influence over the American political scene over the longer term, their influence could result in the election of more fiscal conservatives to public office. There is however a great reluctance in the USA as elsewhere to curtail government spending when such action will cost votes at election time.